2019 Price $39300..This boat is priced to go!! FInance price $29500! 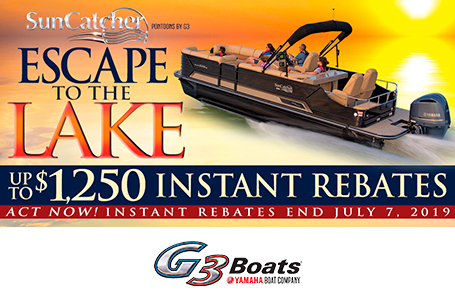 This price includes the boat and 50HP Yamaha motor and trailer. Full Warranty applies! The 20’ SunCatcher V Series Fish & Cruise model is 8’6” wide, with plush interior, new fence design, new console design and a new stereo system. Add in the quiet dependable power of a Yamaha motor and your weekend escape plan is complete. Custom fiberglass reinforced console with fog-resistant speedometer, tach and fuel gauges. Bow mounted livewell has an 800 gallon per hour aerator pump and an insulated lid. A built in rod holder makes fishing easy. Bow fishing location has comfortable high back swivel seat with easy access to livewell and fishing gear. Dry Hull Weight: 1760 lbs. Max Weight Cap: 2000 lbs.